1. Take care of the football – Well this is an obvious one. Cal has a +3 turnover margin in all their wins and a -3 margin in their losses. Zach needs to keep the ball only where his receiver can catch it in this game. An incompletion and/or punting is not the worse thing in the world in what probably is projected to be a low scoring game. In a game where Cal is a 9.5 point favorite, the last thing we want to give the visitors is a short field. I don’t care if we have to run all of Zach’s favorite plays this game, securing a victory here is a must given how much of an underdog we’re likely going to be in our final two games. 2. Blitz and put pressure on Sean Mannion – It’s been pretty well documented how inept Oregon State’s offense has been this year. Cal can take advantage and pressure the quarterback to force the issue and give our secondary some easy chances at some interceptions. There’s no reason given the talent we have on the defensive line and linebacking core why we can’t force some errand decisions by the quarterback. The Beaver offense is heavily reliant on James Rodgers for big plays, and I have confidence in Steve Williams ability to at least contain and make Rodgers work for his yards. 3. 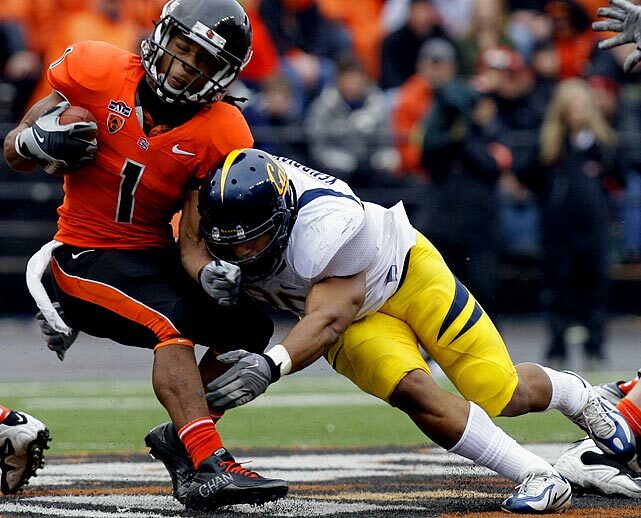 A trick play here or there – It’s been a rather hard road for the seniors at Cal. If they started in 2007, they were apart of the epic collapse which begun when we played this same Oregon State team. If they started in 2008, well that was the last time Cal got a bowl win and it’s seemingly been all downhill from there. Wouldn’t it be awesome to see a play like this run some time? Send the seniors home happy on senior day and let’s leave AT&T with a bang [unless we play here again for the Kraft Fight for Hunger Bowl]. +1 – No more blocked extra points please. I am finally dying with Cal football for the following reasons. 1. The game has passed the coach by. Speed, skilled position players, and imaginative play calling rules the day, with the exception of our team. 2. The AD has no idea how to improve the stale program. The AD needs to take a marketing class at U of O, perhaps interning there for a while to learn how a cutting edge sports program is run. 3. The University leadership really doesn’t know the difference between some Cleaning Product Bowl and the Rose Bowl. Any Bowl will do so long as it keeps alumni quiet.. For those of us who bleed blue and gold, there is no more blood to drain out. Somebody give me some hope.